To the surprise of no one, Manchester City start the move with possession in the opponent’s half. As usual the Mancunians are trying to attack the space between the full-back and centre-back. Cardiff utilise a very heavily man-orientated system, following their opposite number pretty much wherever they go – their occasional willingness to pass on their man if he runs toward a different player the only thing stopping it from being an out-and-out man-marking system. 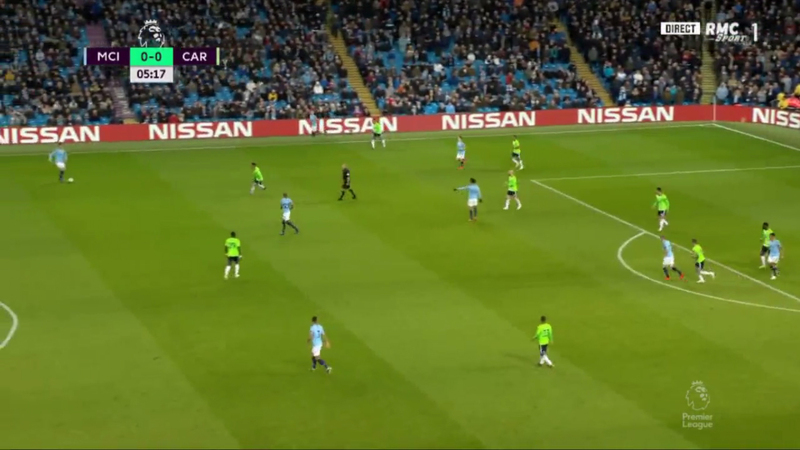 City attempt to use this marking to their advantage, with one of Phil Foden and Gabriel Jesus coming short while the other goes long. The move starts with Foden high and Jesus short, then they switch, Foden dragging away his marker Aron Gunnarsson to open up space for Jesus to run into – Jesus’ marker Sean Morrison is live to the threat though, giving himself a few yards of space to ensure the Brazilian can’t outpace him. The ball is circulated wide to Oleksandr Zinchenko while Foden looks to make a run into the space ahead of Gunnarsson and Jesus moves into the middle to occupy Bruno Ecuele Manga, stopping him from moving across to cover. It’s not exactly clear why the pass isn’t attempted as the camera moves in for a close-up on Zinchenko, but he ends up passing backwards again to Aymeric Laporte. In these brief moments the marking has changed: Leroy Sane has moved inside and Gunnarsson now picks him up, Lee Peltier switches to Foden, and Jesus is now central, moving to Ecuele Manga as Morrison goes free. Kevin De Bruyne has now jogged across from the right with Joe Ralls. Laporte strides forward with the ball while Sane and Foden provide short options, opening up the space behind their defenders. De Bruyne makes a run into the space behind them as Laporte slides a through ball in behind, with Ralls leaving the Belgian for Morrison. The defender is live to the threat but De Bruyne is too fast and is able to finish from a freakish angle. Man-marking allows defenders to stick tight to their men and deny them space, but it can be easily manipulated to create space for a teammate elsewhere. It can also isolate defenders from their teammates, meaning they have to be strong enough defensively to deal with their man one-on-one: Morrison doesn’t do anything wrong here, but De Bruyne is so good that he manages to score regardless.